This is just a quick note that, after almost two years, I am again working on Mumbai and there should be a new version out within the next one or two months. While Mumbai served me well on a daily basis over the last months and year at my job, my job has and will change a bit, so I am back at it. You can expect support for ASM, RAC and Linux and since I am tackling the “Oracle Database 11g Performance Tuning Certified Expert” certification, there will be quite a few performance related updates and additions. A 64-bit build will also be included. If you have any pressing issues or feature requests for the upcoming version, please leave a comment (no promises…). Version 8 of BASH is available and fixes some bugs resulting in no data being flushed to BASH$HIST_ACTIVE_SESS_HISTORY. Again, thanks to Robert Ortel for reporting and tracking down the cause. If you already have BASH installed, you can use the SQL*Plus update script update_v7tov8.sql. Version 7 of BASH is available and fixes two bugs leading to inconsistent rows in BASH$HIST_ACTIVE_SESS_HISTORY. Thanks to Robert Ortel for reporting and tracking down the cause. If you already have BASH installed, you can use the SQL*Plus update script update_v6tov7.sql. Version 6 of BASH is available. If you already have it installed, you can use the SQL*Plus update script update_v5tov6.sql. BASH is now compatible with RAC on Oracle 11.1 and higher. Each instance runs its own collector through a separate scheduler job. Scheduler jobs are created and deleted when starting and stopping the collector through EXEC BASH.BASH.RUN;. The collector detects new instances when running and creates collector jobs for them. Version 5 of BASH is available. If you already have it installed, you can use the SQL*Plus update script update_v4tov5.sql. After releasing the BASH package that makes active session history data available without a Diagnostic Pack license, an ASH data viewer in Mumbai was the logical next step. The layout as shown below is similar to what you might know from the ASH data shown in Enterprise Manager/Cloud Control/DB Console or from ASH Viewer, but there are, in my opinion, a few features and options that let you dig the ASH data a bit deeper. At the top there is the ASH graph over a time scale and you can select an interval with the mouse or use an automatic selection like “Last 5 minutes” from the selection box on the toolbar. The yellow arrows mark the beginning and end of the selected interval. At the lower half of the window you see details for the selected time period. New ASH data is fetched every 15 seconds or whenever you click the update button on the toolbar. 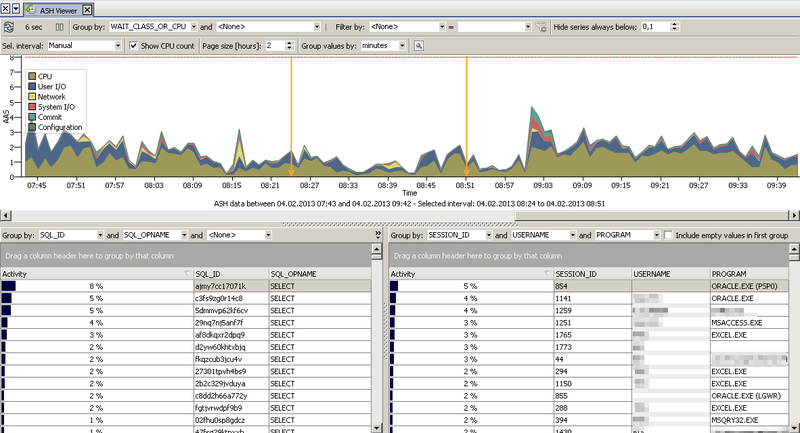 The optional red line shows the CPU count for the database server. Until here it’s probably what you know from other ASH visualizations. The ASH data is grouped by minutes or hours (whatever you selected on the toolbar). The grouping by hour produces a more regularly shaped graph when you look at long time intervals. You can also set the number of hours that you want to see without scrolling the graph (“Page size [hours]”). A very useful feature are the grouping and filter options, so you don’t have to look at the data by the standard WAIT_CLASS_OR_CPU, but you can group by wait event, terminal, module or whatever column there is in V$ACTIVE_SESSION_HISTORY. Further there is a simple “equal” filter, in case you want to look at the data from just one session, module, user, etc. or just at one specific wait event or wait class. For the detail data of the selected interval at the lower half of the window you can group by up to three different columns. 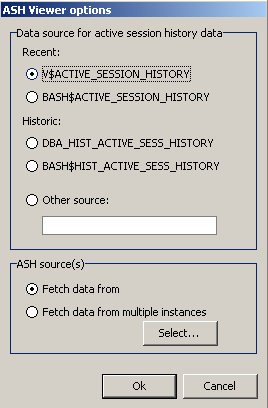 You can select the recent ASH or BASH data or the historical ASH or BASH data by selecting the appropriate views. Further note that you can select data from more than one instance. This might be useful, e.g. for analyzing I/O load from multiple instances running against the same SAN. If you select the multi-instance option, the ASH data will have an additional column DB_SOURCE, so you can group and filter by the source database later. The “Fetch new data every 15 seconds” option is only available when you select the latest “To” time (which is always rounded up to the next full hour). I suggest you start with 2 hour intervals for recent ASH data or up to 24 hour intervals for historic ASH data to see if Mumbai can handle the amount of data and go up from there if you need to. Double click within the legend (but not on a series name) to move it to the other side in case it’s in you way. Note that as default series with values always below 0,1 Average Active Sessions are not shown in the graph, so that irrelevant series do not clutter up the graph. You might need to set it to 0 sometimes to see what you are looking for. Note: This is a historic blog post, that is no longer being updated. Please go to the BASH page for up-to-date information. --                    data collector can not be run from a job session.